Despite being well over 80 years old, 6201 Princess Elizabeth is still admired by many who love steam locomotives for its elegant design, powerful performance abilities and magnificently evocative exhaust sound. Its robustness, sheer guts in hauling huge loads up long gradients and smooth riding qualities have endeared the engine to footplate crews and enthusiast alike. Whilst it may not be the fastest British express locomotive, nor the most modern, it is in many ways the most impressive. Capable of developing indicated power outputs well in excess of 2,000 Horse Power; lineside spectators and passengers on today’s main line special trains can hear everyone of them in action! Amazingly, almost 80 years after she shattered the non-stop times in both directions between London and Glasgow, Princess Elizabeth’s record still stands for steam. Princess Elizabeth is a living testimony to the design quality that Sir William Stanier FRS and his LMS team applied to her creation and development, including the engineering excellence that the craftsmen of Crewe works put into her construction. The Locomotive 6201 Princess Elizabeth Society strives to preserve those values of excellence for the delight, inspiration and education of future generations. They are values that can serve Britain well in the future, but preserving them and 6201 requires constant effort, skill and above all else investment in the locomotive. 6201, LMS lot number 99, was built at Crewe for the sum of £11,675 and named Princess Elizabeth, after the then Duke of York’s eldest daughter, now our present Queen. The locomotive left the works on 3rd November 1933 and with sister Classmate 6200 Princess Royal created a sensation; they were a very dramatic indication that the days of the former Midland Railway’s policy of small engines was over and a new power was abroad in the land of the world’s largest railway company, the L.M.S. The 1936 Record Run made by ‘Princess Elizabeth’ is an enduring piece of railway folklore, and anyone wishing to discover the full story and detail could do no better than referring to the definitive publication on the Loco – “6201 Princess Elizabeth” – written by Society Chairman, Clive Mojonnier. It is, however, interesting to reflect on the times in which that record was set (and remained unsurpassed in the days of normal steam working, and as a non-stop run, almost certainly still does!). There was no internet, and little access to television. Some of the population had a wireless but for the most part news travelled – very slowly by modern standards – via newspaper. The Railway Companies at the time naturally sought publicity and clearly some form of eye-catching record was certain to bring the all-important attention of the Press. By 1936 the ‘Stanierisation’ of the LMS had really taken hold, and the Company was keen to present a public image which reflected the very necessary, radical changes and improvements which Stanier had brought about. This was set against a background of competition with the LNER which, with the advantage of the relatively flat and straight East Coast Route, was able to – and did – run very successful short formation, and thus lightweight, high-speed trains. The operating conditions confronting the LMS were very different, the route was altogether more demanding and the need to operate heavy trains was ever present. Loads of over 600 tons of up to 17 coaches were commonplace and they had to be lifted to the summits of Shap and Beattock en route to Glasgow. 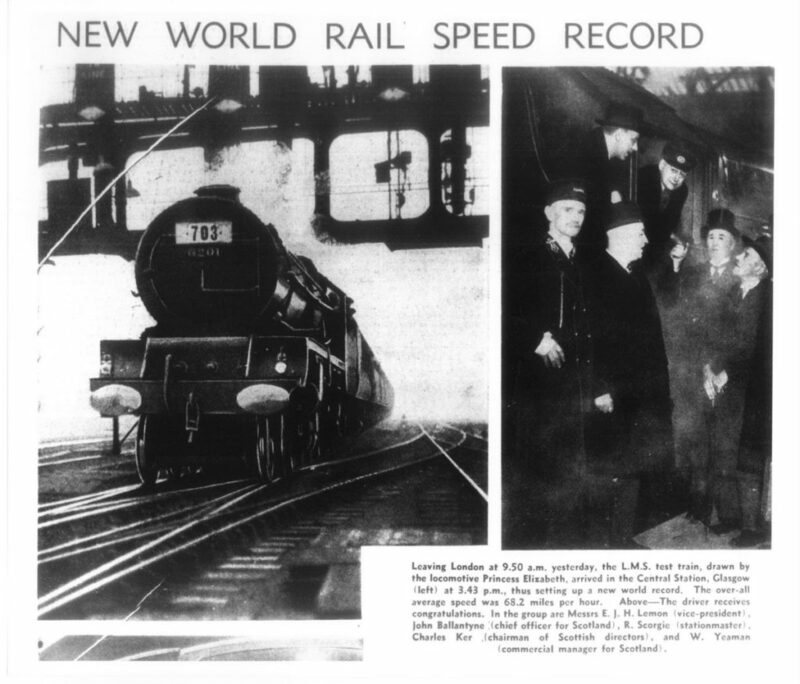 In a direct attempt to steal the limelight from the LNER the LMS elected to go for an Anglo-Scottish record over the West Coast Route which would rival its competitors ‘Six Hour Edinburgh Expresses’. So it was that the plans were drawn up – clearly success depended on tightly controlled conditions and meticulous planning, and 6201 was selected to make what was, unashamedly, a record-breaking attempt. The record was achieved and there was huge national press, film and radio coverage that would today be described as a ‘publicity coup’. The rest as they say ‘is history’, but the fact remains that 6201 achieved lasting national and international acclaim as did its driver Tom Clark, of Crewe, who was awarded the OBE in recognition of his remarkable skills as the driver. The OBE was presented by King George VI to driver Clark after he had driven the Royal Train to London in 1937. In later life 6201 has notched up a few more ‘firsts’, but above all else she remains the Locomotive which set the record for the longest, hardest and fastest non-stop run with a steam hauled passenger train. Whilst in terms of pure fame this cannot expect to be as glamorous as Mallard’s outright speed record (also achieved under specifically created conditions) it was nevertheless equally – if not more difficult – to achieve and is without doubt of huge historical merit and significance in its own right. It created an iconic reputation for 6201, which earned her the affectionate nickname “Lizzie”. In the late 1940’s the Big Four, namely LMS, GWR, Southern and LNER were nationalised under the new name of British Railways and 6201 was re-numbered to 46201 and re-painted initially into LNWR style BR black then in to Brunswick Green.